It is important as an artist to use what is available to us not just what we'd like. Since I ate a grapefruit a couple days ago, I obviously took some photos of it first. I really love the pink-red of the fruit's flesh and the yellow rind. These two artworks were from the same photo session here in the "studio". I again went for a painterly look because I wanted to keep them very soft and gentle almost delicate. I made the effect in the second one much more subtler than the third one because the painterly look made the flower petal edges so indistinct that it was difficult to view so I mixed some of the original back. In the third version, I added extra highlights to the petal ridges and did some darkening around the edges. I like both of them for very different reasons. I think a collector might enjoy having prints of all three. This pose makes me think of achievement or victory so I decided to make him look like a trophy figurine without the stand or label. I was surprised to discover that it didn't take many layers to achieve the look I wanted of a glowing abstract male trophy. This work is trying to show the model in a more innocent reflective pose. I'm very tempted to make another version with angel's wings. Here he is contemplating life in a pure state as if he was sitting on peaceful clouds. I took a series of different pose photos a couple evenings ago for use in a work however the lighting was poor so I didn't feel these would work for that purpose so instead I'm using them with different effects. It was good practice. This first in the series is Followed. I was surprised to find a distinct shadow behind him so I enhanced it a little. I find it quite disturbing yet thought provoking. This yellow wildflower was pretty, but it is on a very sharp plant covered in tiny spines or thorns. I gave it a low-key painterly look full of shadows and highlights with a canvas texture. I took photos of some more wildflowers that I picked a couple weeks ago. I'd rather take the photos there, but the recent rains have flooded the park's paths and also the last time I spent more than 30 minutes in the park, one of the loser neighbors called the police inventing that I was doing some activity that anyone with good eyesight would know immediately that I wasn't doing that. These little white wild flowers started blooming around the end of August. When a fractal image is inserted into another program for changes/resizing, etc. the resolution can change a lot thereby affecting the quality of the image. When you are creating the original image, make sure the file is large enough so that you can make changes within the original program and also, you can set the correct resolution and image quality. If you do these things prior to putting the image into another program, you should not have any problem. I learned this the hard way when a printer refused to enlarge my art saying my images became too distorted at larger sizes. I had been in the habit of creating images in Chaoscope, then transferring them to Paint Shop Pro to add color and texture and make further modifications. Always use anti-alias to minimize distortion and save your file in a lossless format as opposed to lossy. A few lossless extensions are png, bmp, gif, tiff or psd. Lossy extensions mean that you lose image data (resolution) every time you upsize it and that data cannot be recovered. JPEG is a common lossy format although it is often used for final prints as it requires less file space. Resizing is not a problem with all fractals programs and there is software out there that promise to resize your image to any proportions without loss of resolution. Genuine Fractal is a plug-in for Photoshop that promises to do this. Apophysis is another fractal program I use frequently. It has straightforward menus for sizing and rendering at a desired quality but some printers (printing companies) can be fussy about these designs also. So it pays to just take that extra time and take a few staps to make sure your submitted image is of the highest quality possible. Collecting fine art is an inspiring and stimulating pastime, not just for the wealthy. There are many kinds of art to choose from, as the definition of what art actually is differs from person to person. It doesn’t matter what form it takes, the choice is yours in what you like and how much your budget is. As an artist going to college in New York, it has been apparent to me that some who appreciate art may disrespect others for their differing tastes in art. For example, there are those who only buy originals, and never prints. For enjoyment purposes, an original isn’t necessary to own if the price is out of your budget. Prints are a great way to own framed art that looks lovely on your wall, as an original would, at a fraction of the price. Ok, you won’t have the same texture to the painting (the surface of an original can show texture and dimension, whereas a print won’t). But, a well printed piece of artwork is not settling by all means. My walls are graced with the art prints of other artists, bought fairly inexpensively online, at art fairs and galleries. They are tasteful and not cheap looking. When you find a print or original that you like, you can either frame it yourself or have someone else do it for you. Frames come in a huge price range, from the lower priced metal frames to the ornate, hand carved wooden frames that can cost big bucks. Using a mat, which is a way of framing the picture inside the frame using illustration board or papers, can set off or detract from your print. For those who don’t know framing, take your picture and have it framed first, then watch how they offer you various mats and frame styles. Take your time and choose what color combination of mat, frame and artwork would look tasteful and appropriate in your home. For a clean, contemporary look, a good type is the inexpensive but still elegant Nielsen brushed metal frame. They come in many colors, but black or bronze are safe to start with. When selling my artwork in galleries, I use bronze ones because they make my art look good, and don’t cost a fortune. After all, many people who buy art in galleries have the art re-framed after they buy it, to match their home décor. If wood is more your style, there are some lovely, natural, stained wood frames. My preference is cherry or mahogany for my home, because they have a deep, rich reddish color that looks elegant. The style you choose is up to you, just remember that you’ll be living with it for awhile, and so think of what you want to see on your wall for an extended period of time. You can re-frame later, of course, but to save money, choose something that you’ll be happy with so that won’t be necessary later. Whether you like prints, originals or other forms of art, enjoy whatever you choose. To me, the purpose of art is to enrich our surroundings, add beauty to a room and convey a mood or interest. Everyone has their own views, so go with what stirs your emotions or interest. Have a budget in mind and stick to it, as most art is for personal use, not for investment. If you buy the work of someone famous, the piece may have value but who knows what tomorrow will bring. So, first and foremost, go with what interests you. That way, if reselling it isn’t going to give you much (if any) profit later, it will still make your wall look beautiful, As a professional artist, I want my clients to love their purchases, and be happy that they own whatever they bought from me. Other artists want you to be happy too. Art is for enjoying, so don’t be afraid to try collecting. Chances are, you’ll be hooked once you do.Collecting fine art is an inspiring and stimulating hobby for everyone, not just for the rich or famous. There are many forms of art to choose from, as the definition to what art actually is differs from person to person. It doesn’t matter what form it takes, the choice is yours in what is attractive and how much your spending limit will be. As an artist going to college in New York, it has been apparent to me that some aficionados of art may look down on others for their differing tastes in art. For example, there are those who only buy originals, and never prints. For enjoyment purposes, an original isn’t necessary to own if the price is out of your budget. Prints are a great way to own framed art that looks lovely on your wall, as an original would, at a fraction of the price. Ok, you won’t have the same texture to the painting (the surface of an original can show texture and dimension, whereas a print won’t). But, a well printed piece of artwork is not settling by all means. My walls are graced with the art prints of other artists, bought fairly inexpensively online, at art fairs and galleries. They are tasteful and not cheap looking. Whether you like prints, originals or other forms of art, enjoy whatever you choose. To me, the purpose of art is to enrich our surroundings, add beauty to a room and convey a mood or interest. Everyone has their own views, so go with what stirs your emotions or interest. Have a budget in mind and stick to it, as most art is for personal use, not for investment. If you buy the work of someone famous, the piece may have value but who knows what tomorrow will bring. So, first and foremost, go with what interests you. That way, if reselling it isn’t going to give you much (if any) profit later, it will still make your wall look beautiful, As a professional artist, I want my clients to love their purchases, and be happy that they own whatever they bought from me. Other artists want you to be happy too. Art is for enjoying, so don’t be afraid to try collecting. Chances are, you’ll be hooked once you do. “A picture is worth a thousand words” they say, and I would whole-heartedly agree. But the question remains – Which thousand words? For those of us with photos and other art in Products or Print on Demand services, the description can make the difference between a lucrative website and a real dud. Descriptions which evoke an emotion are ideal, because they can make a strong connection with the visitor to your site, and increase the chances that they will actually click on that little shopping cart, making the move from “browser” to “buyer”. Many artists have difficulty writing these evocative, descriptive phrases and sentences. So here is a three-part guide for those of us who are verbally or compositionally challenged. Step 1: Making a list, checking it twice. You are (presumably) an artist. Your purpose in creating art is to connect with your audience, and to draw an emotional response from them. So go back and look at your artwork and ask yourself, “What emotion or emotions am I trying to communicate here? How does this image make ME feel? How might someone else perceive it?” Make a short list. Consider simple, “surface” kinds of impressions, and also deeper meanings. Also consider opposites. For example, a picture of a black bird on a white background may be “spooky” to one person, be about contrasts in nature to someone else, and to another will speak of the hope for mankind in goodness and light overcoming evil. Step 2: Variety is the spice of life. Now get out your thesaurus. A good on-line one is http://thesaurus.reference.com/ which gives opposites as well. Add to your list. Look through your list and select five or six of the words that are most elegant or poetic, and most evocative of the dominant emotion in your image. Try to emphasize the positive, although some images are intended to examine darker subjects. Save your list so you can use it to add to your keywords. Now take your list and use it to compose one or two sentences incorporating your words. Don’t worry too much about proper sentence construction, but pay attention to spelling. Make it personal and draw the reader in with words like “I”, “we”, “share”, “common”, “together”, “world”, “mankind”. Where possible, make it immediate by using verb-forms in the present tense: “I am”, instead of “I was”. Use first or second person; avoid third person, as it is emotionally distant. Read your description out loud while looking at the image, and see if there is a connection between the two. If you feel it misses the point of the image (you are, after all, the artist), then try switching some of the words around, or add more adjectives, or trade some of the list words for others. Don’t be afraid to scrap it and start again. With a little practice, this process can be quite effective and rewarding. One good thing about taking the time to write good descriptions is that once they are done and saved, you can quickly copy-and-paste them anytime you use those same images in a new site or album, so it is definitely worth the effort. It will really save you time in the long run. Just try not to make it too long – definitely not a thousand words! 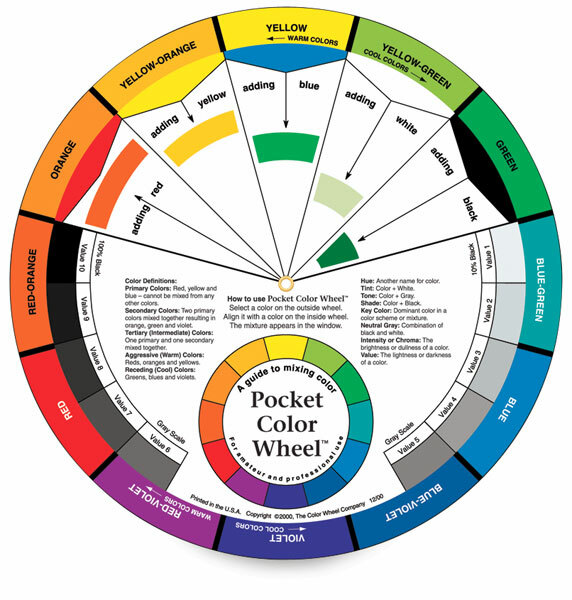 Color Theory can be easily explained with a color wheel. Every artist, especially beginning painters, should have a color wheel. This helps reduce error in mixing paints and ingrains the primary, secondary and tertiary colors in your mind through repetition of reference. 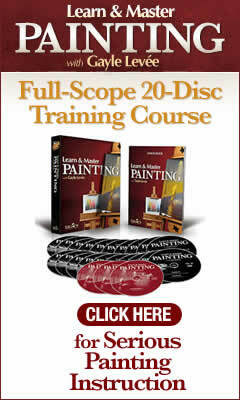 Many experienced painters can eyeball paint colors and come up with a perfect match in the new mix. Many of us that have this ability have it BECAUSE of the repetition of mixing and many are born with the talent and develop it further. First, we'll talk about primary colors. Red, Blue, and Yellow. With these three colors, you can make all of the secondary colors. If you mix red and blue, you get violet. If you mix red and yellow, you get orange. If you mix blue and yellow, you get green. Thus, the secondary colors are violet, orange, and green. Of course, if you are mixing a secondary color and have more of a lighter hue than a darker, then the resulting value will be lighter. This is just logic. For example, take a large amount of yellow and a small amount of blue. This gives you a VERY light green. Thus it follows that the reverse would be true, i.e. lots of blue and very little yellow gives you a blue-green that is more blue in hue. Spend a day with some cheap acrylics and paper plates, mixing colors, and seeing what you get. If you find a color you really like and want to use, use your palette and try to match it based on the sample you made and mix a larger quantity. if you can't get to it right away, use your spray bottle to spritz the paint and the saran wrap you should keep handy for covering the paint, and cover it. Try to get back to it within a few hours, or it may dry up on you. Once you feel you are firmly grounded in mixing colors (and it takes many people a while to feel confident with it), then you can introduce gessos, because you will then learn that the color you were working with will change depending on the amount of gesso and water you've got incorporated into the mix. My next blog entry will be about using these additives in your acrylic paints and the differences they make in your medium. Until then, get a color wheel, some cheap acrylics and play. Play with color, play with learning fundamentals, and have fun.